...the lowly Marsh Marigold, aka Caltha palustris. The Marsh Marigold, which I planted out in my detention pond last year, barely edged out my patch of Sanguinaria for first native blooms of the season. And what cheerful blooms they are after the winter! People as well as pollinators can spot the brilliant yellow of the flowers from far away. 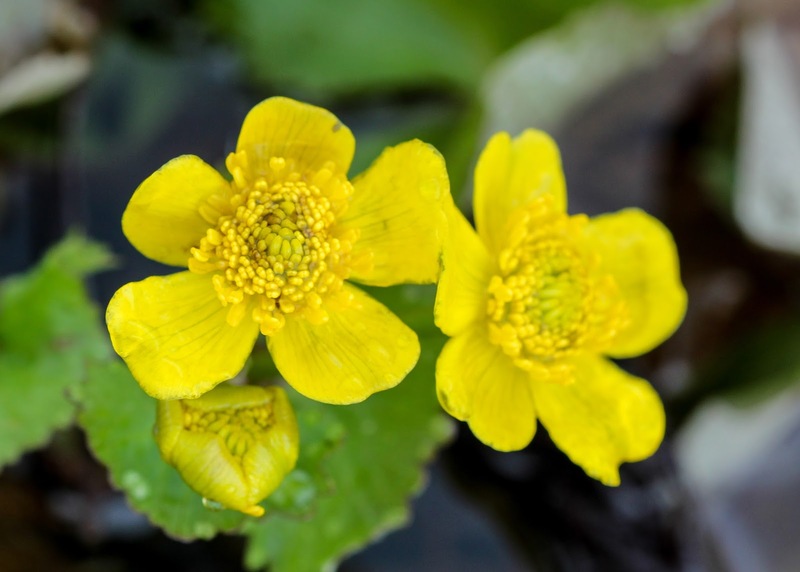 The botanical name for Marsh Marigold is very apt, as 'Caltha' means 'goblet' and refers to the shape of the flower, while 'palustris' is Latin for 'of the marsh'. 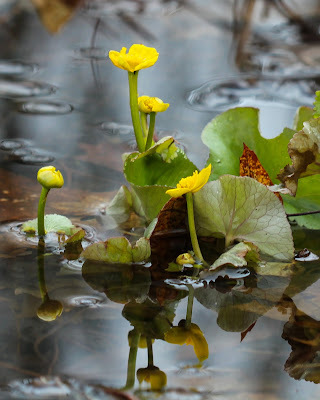 The Marsh Marigold is actually part of the buttercup family and not a true marigold at all. 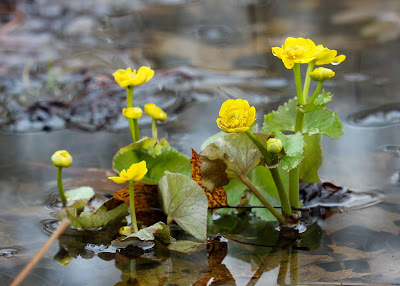 As one of the harbingers of spring, Marsh Marigolds have been used throughout history in various spring celebrations. The nickname 'marigold' refers to its use in medieval church festivals honoring Mary (i.e. 'Mary gold'). 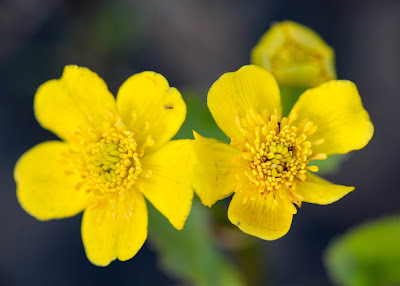 In parts of Ireland and the UK, this spring flower was picked on April 30 - the day before May Day - and placed on doorsteps or in mailboxes to keep away evil sprites and fairies. 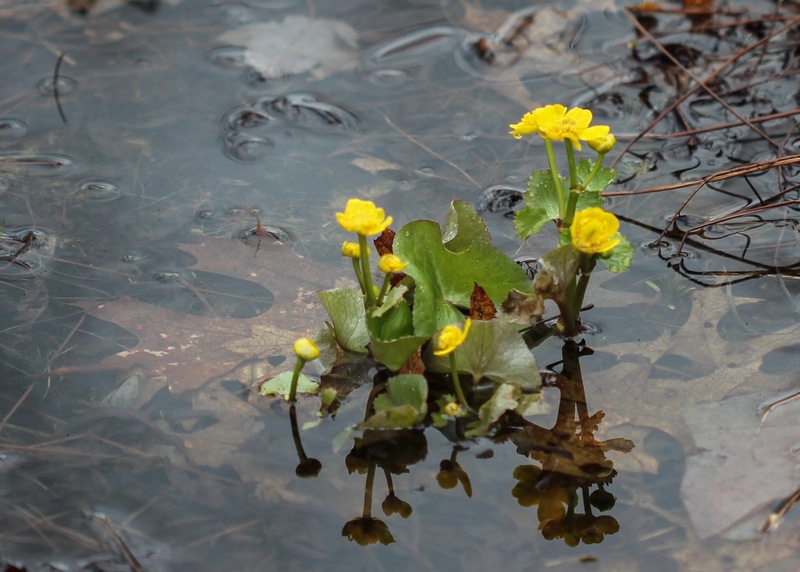 Marsh Marigold is native to the Northern Hemisphere and blooms between early spring and summer, depending on its location. It is hardy in zones 3-7, and prefers full sun to part shade. As you might expect, it likes wet soil. If there is a dry spell or the weather turns hot, the plants might die back and go dormant until the next spring. 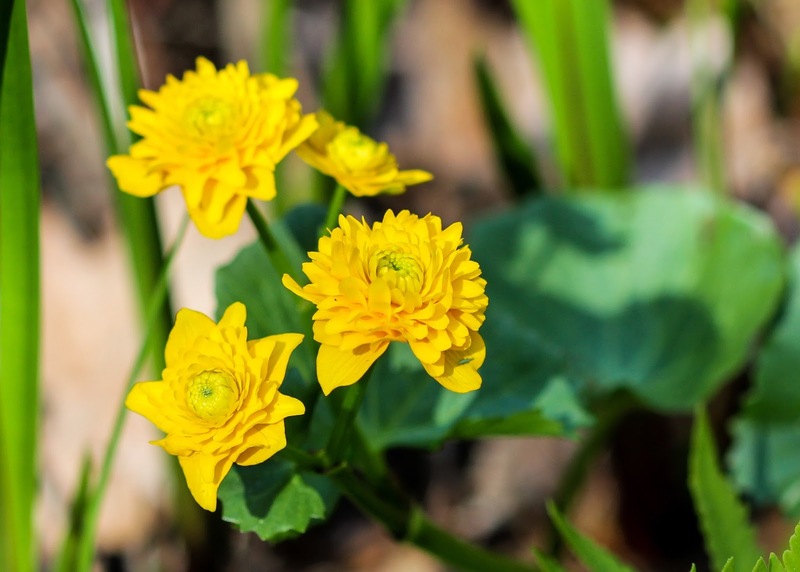 It will spread to make large drifts and is easily divided after it blooms. There are several different varieties and sub-species of Marsh Marigold available, some with pale yellow or white flowers, and some with doubled flowers. 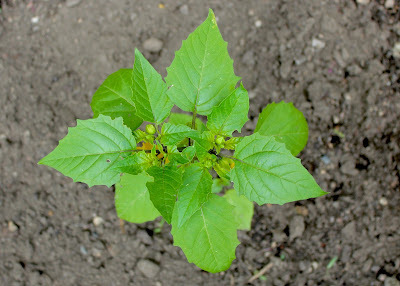 Some people are allergic to the sap, and all of the plant contains a toxic glycoside, so it should never be eaten raw. Young leaves are edible after being boiled in a couple changes of water, and young flower buds can be cooked and pickled like capers. As the plant matures, however, the amount of toxin increases, making it more unpalatable. Thankfully this toxin also makes it quite resistant to the ever-present deer and rabbits in my yard. I just enjoy the blooms as the much-welcome heralds of spring that they are. Happy May Day, and happy Spring! The past couple of years I've helped lead workshops on seed starting, and I find that many people are hesitant to start seeds indoors. Even a Master Gardener I know confessed that there is something about seed starting that scares her silly! On the opposite side of the spectrum, my kids wonder why I would even bother to lead a workshop on seed starting. According to them, you stick a seed in some dirt and voila! Sadly, it's not quite so simple as that, but I have a few tips that give me pretty good results every spring. 1. Plan when to start the seeds. Thankfully most seed packets will tell you a lot of information about how to grow your seeds, including how long you need to grow them before planting the seedlings outside. You will need to factor in time for your seeds to sprout (usually around a week). 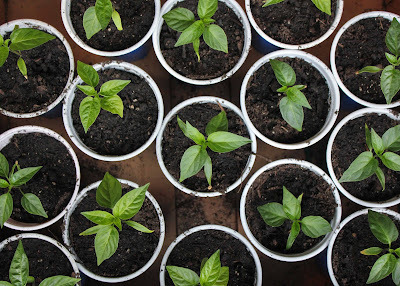 You will also need to plan for a week or two to slowly introduce your seedlings to the outside environment before planting them outside so they won't go into shock, a process called 'hardening off'. pretty good instructions on when to start the seeds. Many summer vegetable and flower plants don't like cold weather and won't be able to be put outside until after the last frost of the season. You can find out around when the last frost in your area will be by searching online. 2. Use a sterile soil or seed starting mix to plant your seeds in. 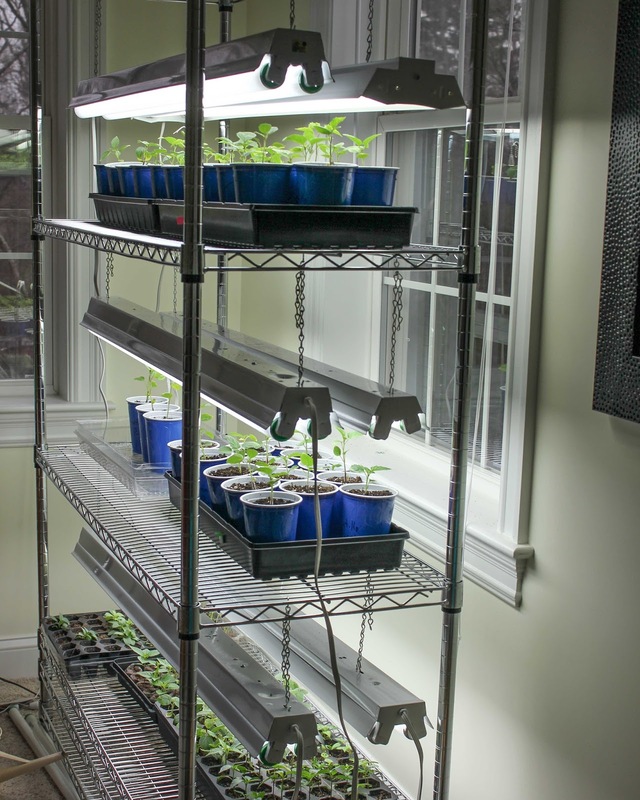 Don't just use soil straight from your garden to plant your seeds in indoors. Outside soil or even those big bags of potting mix may have bacteria, fungi, or bug eggs in them that might hurt small seedlings. Instead, use bags of seed starting mix, which are completely sealed and sterile. They are made of a water-retaining mix of peat or coir with some perlite or other light, fluffy materials added. Another sterile option that is easy to use are those compressed peat pellets that expand when you add water. If you do want to use a potting mix or soil that you have lying around for seed starting, you will need to sterilize it first by heating it to between 180° and 200°F (85° to 90°C), which will kill off any nasties. 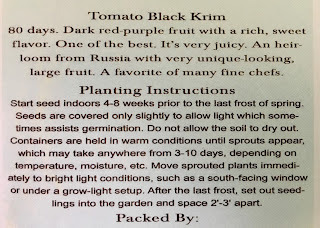 I usually do this by putting the soil in a large bowl, moistening the soil, covering it with plastic wrap, microwaving it for 3 to 5 minutes, and then letting it slowly cool. 3. Plant your seeds in moist (not soggy!) soil and then cover them with plastic to keep them moist until they sprout. 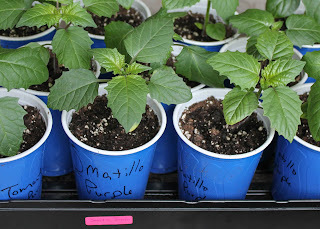 Many seed trays will come with a plastic cover to cover them with, or you can use plastic wrap. Some seeds like some light for germinating, some like darkness. Some like it cool, most like it nice and warm. 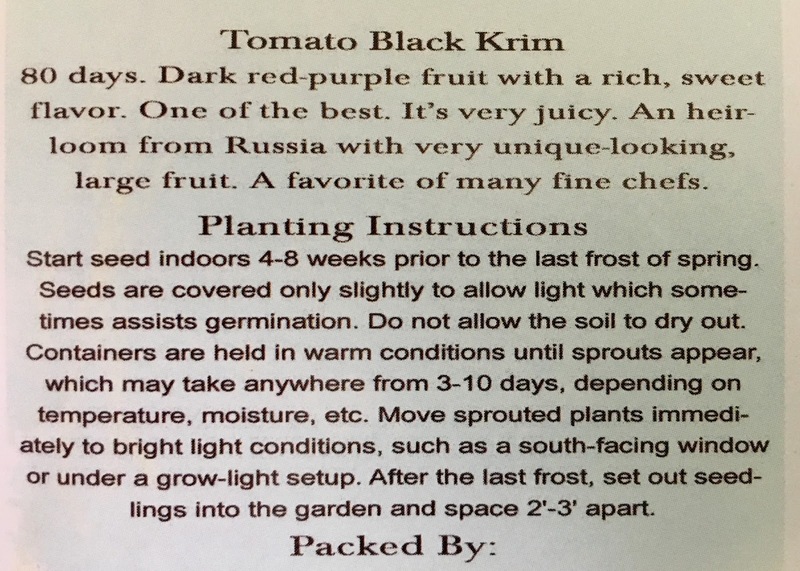 (Your seed packet should tell you, or you can use search online.) Just don't put your seed trays in direct sunlight, as that will cook them. 4. After the seeds sprout, they will need air, water, and lots of light! 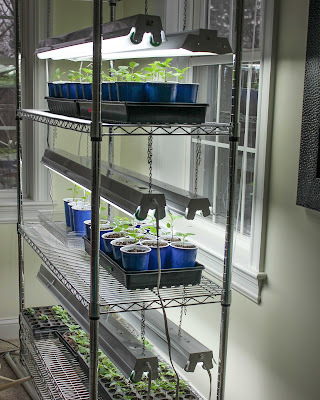 When most of the seeds have sprouted, uncover them and put them in a sunny window or under some fluorescent shop lights hung a couple inches above the plants. If you are using florescent lights, pick the light bulbs that cover the full spectrum of cool and warm. Keep them on for 12 and 16 hours a day. (My lights are on a timer from 6am to 8pm.) 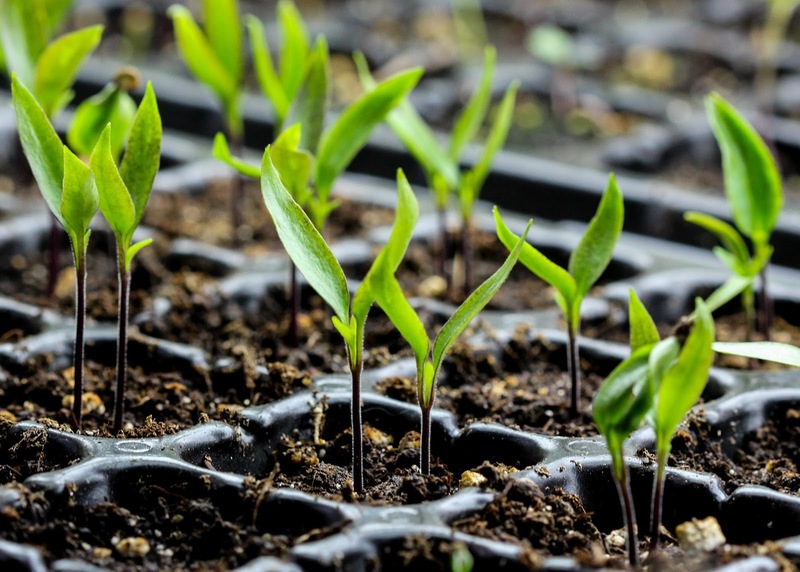 Water the seedlings when they get dry, but try not to water so much that they are sitting in soggy soil. 5. Put on a fan. Good air circulation prevents fungal diseases. Keep a fan nearby running on low. 6. 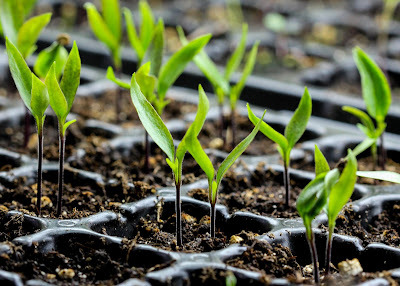 Start fertilizing at half strength after the seedlings start growing their first true leaves. 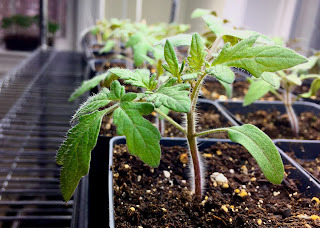 If you are using a seed starting mix of peat or coir, it likely doesn't many nutrients in it. When the seeds first sprout their first baby leaves, they are using energy stored in their seed. However, when they start sprouting their next leaves (called their 'true leaves', since the baby ones will at some point fall off), they need some nutrients. Fertilize at a diluted half strength every couple of weeks. A liquid fish or kelp fertilizer is great. I tend to use whatever fertilizer I have on hand. 7. 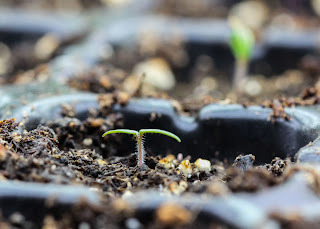 Once your seedlings get a little bigger, thin them down to one plant per cell or pot. 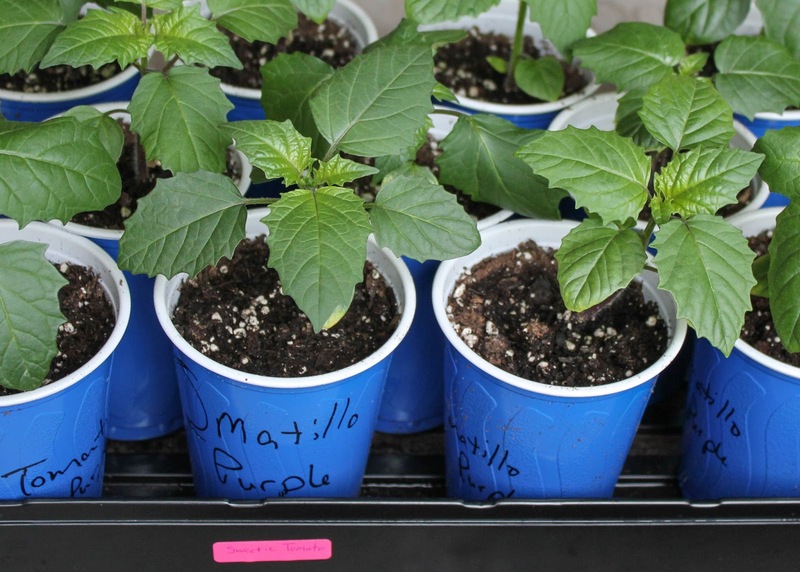 Lightly run your hands over the seedlings for a minute or two every day. This actually helps toughen them up and grow stronger. 9. 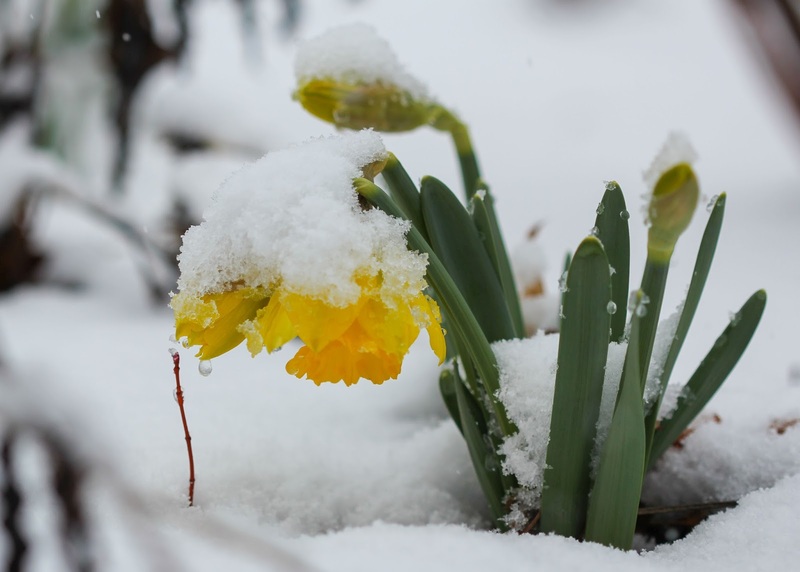 Harden your plants off gradually starting a week or two before planting outside, and keep an eye on the weather. Like I previously explained, if you just plant your seedlings outside right after being in a nice, climate-controlled house, they will go into shock. 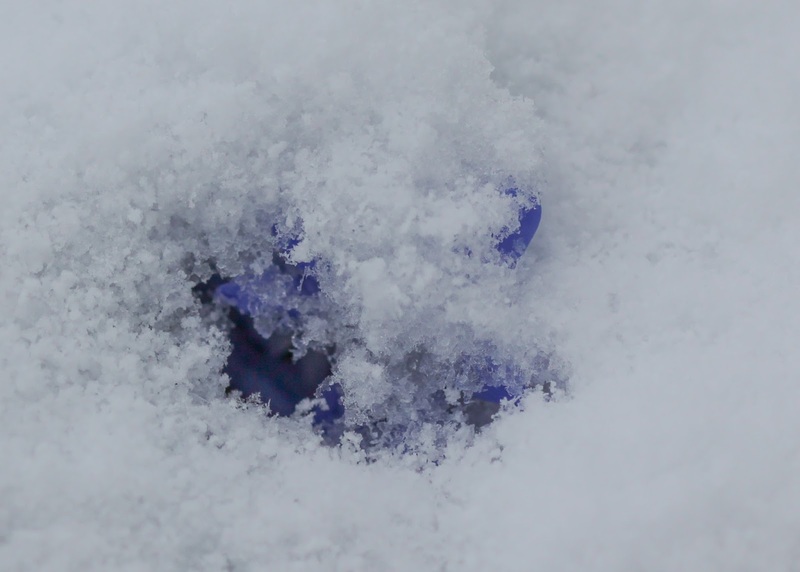 Start getting them used to the elements by putting them in a shady, protected place outdoors for a couple hours. 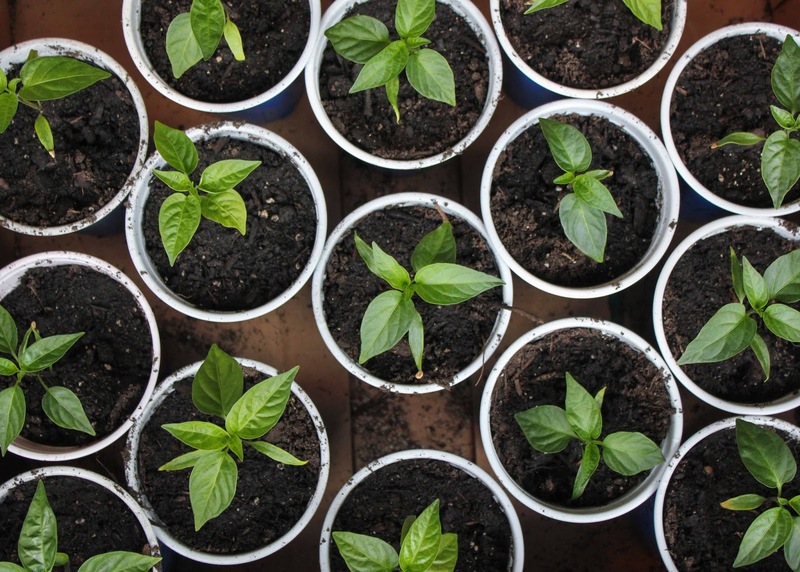 Each day, gradually increase their exposure to the sun and wind until they are ready to be planted outside. Keep an eye on the weather! 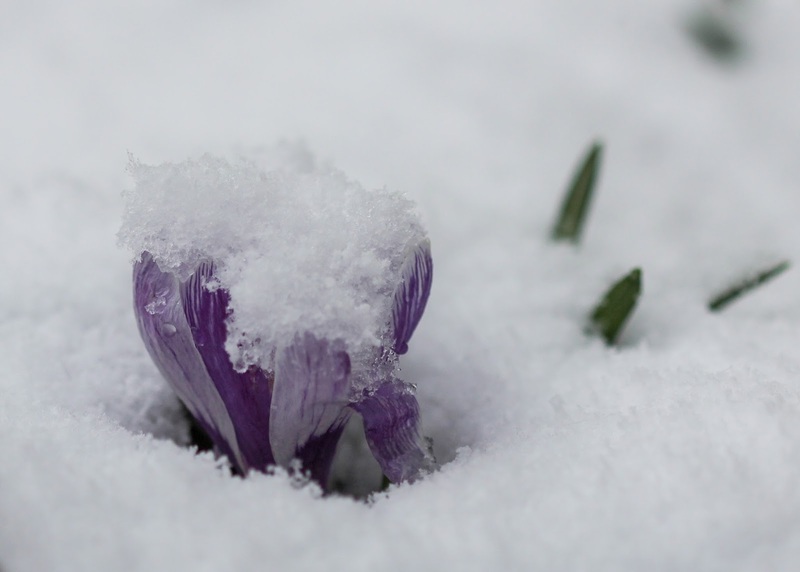 If there is a late season frost forecasted for after you've already planted your tender annuals outside, cover them with a sheet or blanket overnight. 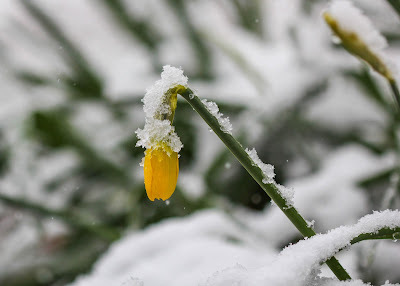 what does April snow bring? The coming May blooms might want to go into hiding for a little while!